As a reformed hoarder of thrift store junk, this is probably my favorite way to use spray paint. Just take any plain jane trinket, none of which will match if they come from a thrift store, and cover them in spray paint. 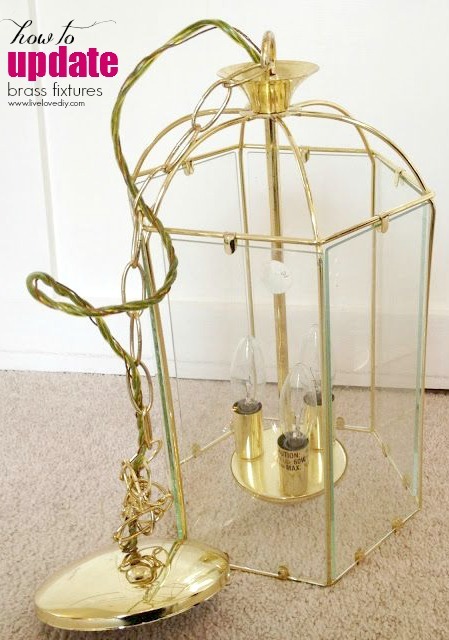 It's a great way to save money on decor accessories and it almost always works. 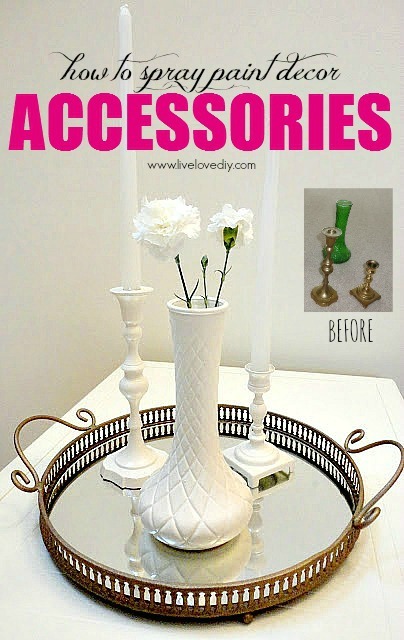 In the above example I used some antique white spray paint to update 2 bronze candlesticks and a green vase. 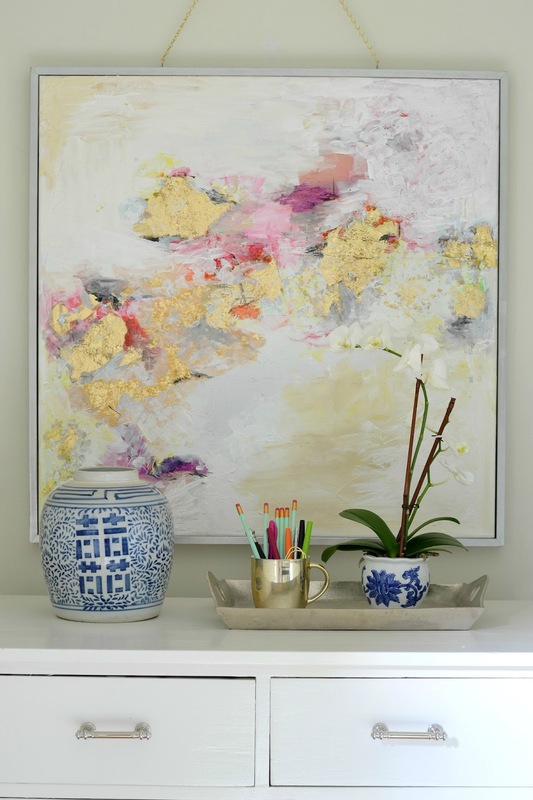 In the below picture, I used my favorite silver spray paint to update a mirrored tray, a vase, and the frame on that artwork. 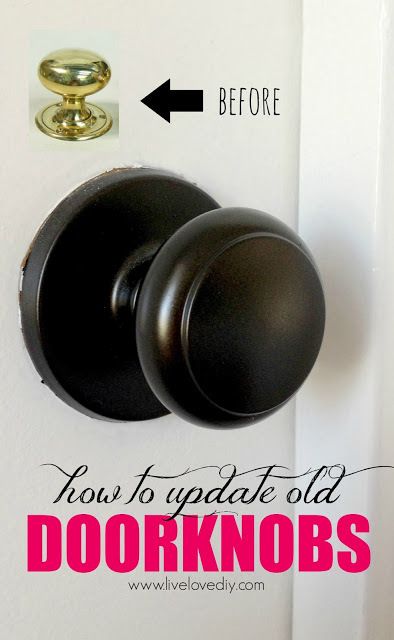 When we first moved into our house, all of our doorknobs had an outdated brass finish. So, rather than spend hundreds to replace them (which wasn't really an option at the time), I spray painted them with my favorite oil rubbed bronze spray paint. #2. Spray paint light fixtures. Over the past few years, I've slowly replaced most of the outdated light fixtures in our house. To save money, I searched local thrift stores and craigslist for light fixtures that had a great shape, and then I spray painted them. Here's the before of a $5 thrift store chandelier I bought. And here's what it looked like after I spray painted it with this silver spray paint (affiliate link) and hung it in our office. You can find the original post on this chandelier here. I did the same thing to the first chandelier I ever hung in my office. I found an old brass chandelier on eBay, and spray painted it white. 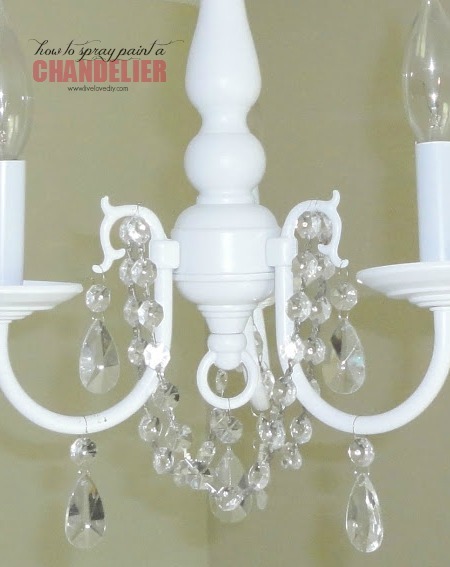 I also added strings of crystal beads to it, and created my own little crystal chandelier. That was one of the first blog posts I ever made. Spray paint is also a great way to update an old lamp. I found this one at the thrift store for just a few dollars, but it was horribly dated. So I spray painted the base silver and added a new drum shade with a black ribbon hotglued around the top and bottom. 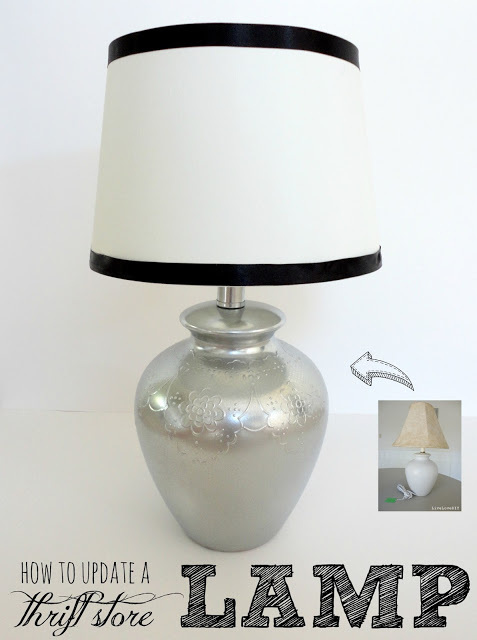 I also recently spray painted two thrift store lamps in our guest bedroom a high gloss white. It's such a great solution if you don't have $50-$200 to spend on a lamp. 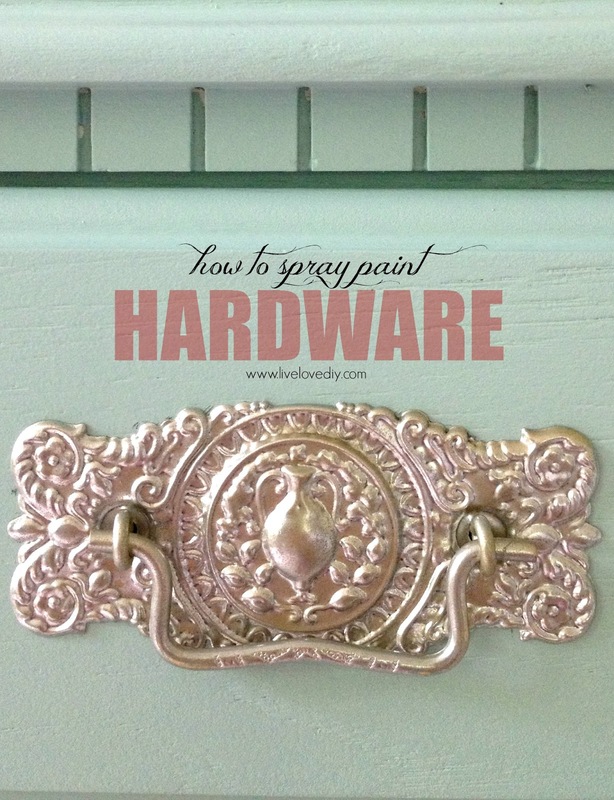 If you don't love the original hardware on a piece of furniture (or in your kitchen/bath), you can easily update it with a little spray paint. For instance, I updated the brassy pulls on my blue dresser with a little spray paint trick I learned. 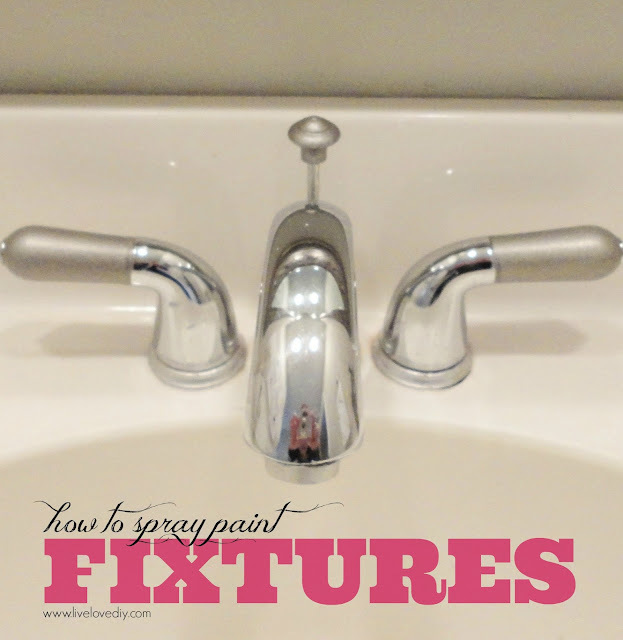 To get them to look a little more dimensional, I sprayed them first with Rustoleum pure gold, let that dry, finely sanded each handle, then added a little Rustoleum Bright Coat Chrome (affiliate links). The gold gets into all the deep grooves, and the silver kind of highlights the raised parts. I also love oil rubbed bronze for hardware, too. It's really versatile, and goes well with both gold and silver accents. I recently used it on our media console hardware. Being willing to spray paint a frame opens up endless possibilities while thrifting. You can completely ignore the current color of items, and just pick stuff up based on the shape. Nearly every mirror or frame in our house has come from a thrift store or yard sale, and most have gotten spray painted. One of my favorite techniques when spray painting a frame is to spray some of the deep grooves black first, and then go over it with silver spray paint. I used this trick on mirror frame in the below picture. You can even make your own frame out of some scrap wood and then spray paint it, like I did on my DIY gold leaf art. This is one of my favorite spray paint techniques, combining spray paint and painter's tape to create stripes. 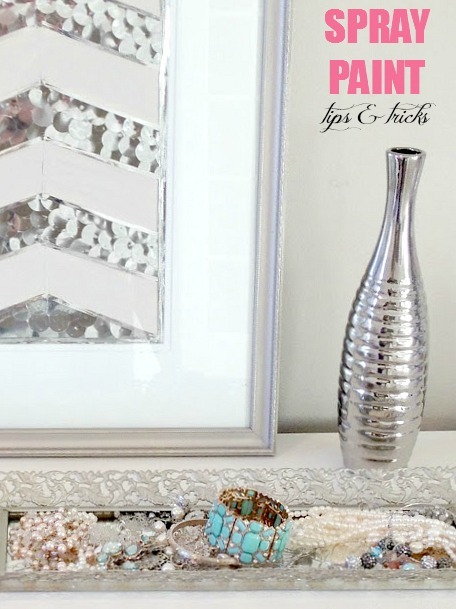 I did this on my DIY jewelry organizer, and it turned out pretty cool. 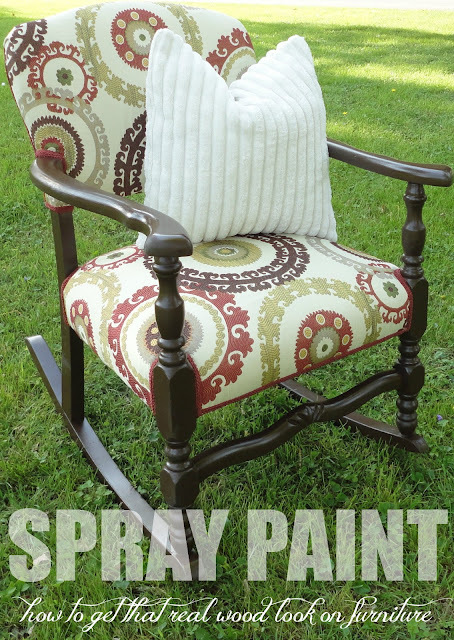 Spray painting furniture is an easy way to update a piece without tons of effort. It works best on smaller furniture like end tables or chairs. For example, I spray painted our kitchen barstools silver and they've held up perfectly for years. 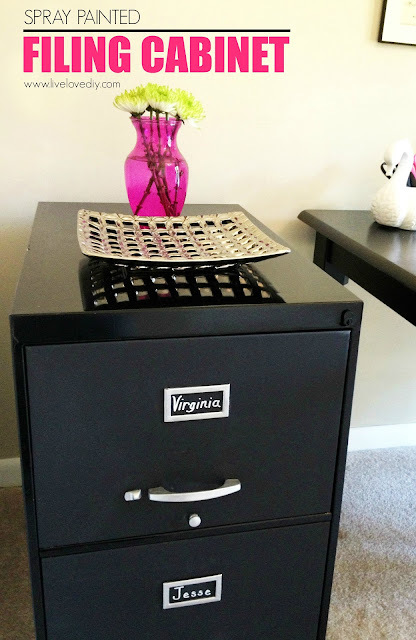 Another example is this filing cabinet. I spray painted the frame a high gloss black and then used chalkboard paint on each drawer front. I also spray painted this rocking chair dark brown to mimic an espresso wood tone. I had a bunch of outdated brass curtain rods in our master bedroom, and rather than replace them, I just spray painted them with some oil rubbed bronze spray paint. It was a great solution and saved me probably $50 a window. We had a lovely two-toned set of fixtures in our guest bathroom. I absolutely hated them, but couldn't afford to replace them at the time. So, I spray painted everything. And it's has held up perfectly for nearly 2 years now. 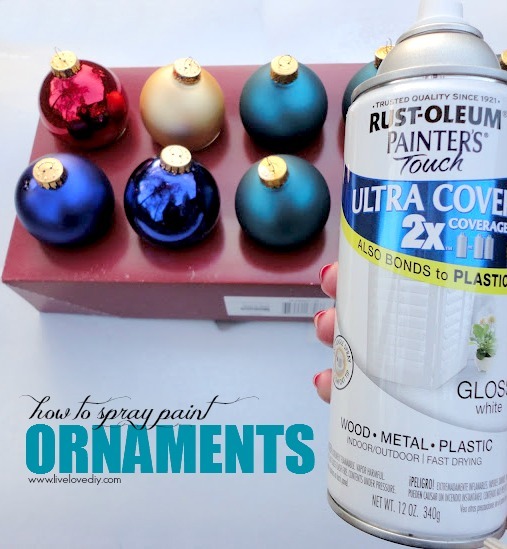 Last year I found tons of ornaments at the thrift store, bought about 100 for less then $2, took them home and spray painted them to suit my needs. I made a bunch of silver ones for my ornament wreath and some white ones for my tree. It was so easy to do, too. Just use the box they come in to prop them up while you spray paint them. I did something similar for Halloween, too. I bought a bunch of plastic pumpkins at the dollar store, spray painted them silver, and used them for decoration. See details here. Over the years, I've learned a few things about the different spray paint products available, and I've used all sorts of different brands. 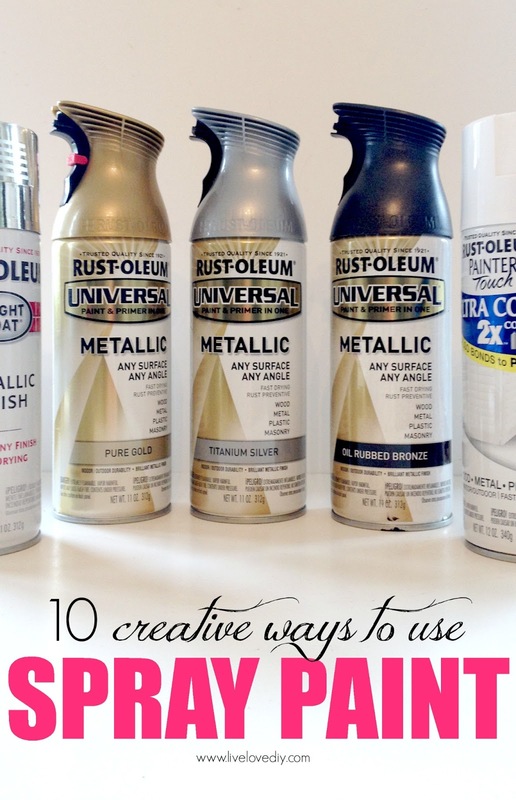 My favorites are Rustoleum, Krylon, and Valspar. 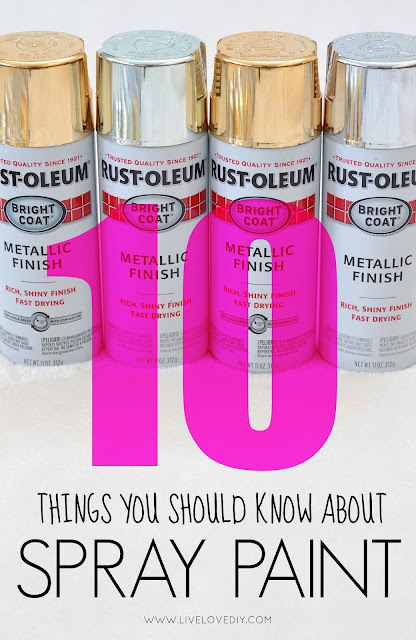 I prefer the quality of Rustoleum over anything else, but sometimes use Krylon and Valspar as they both have more color options than Rustoleum. The most durable (in my experience) is the Rustoleum Universal. The three in the center (below) are my favorites: Pure Gold, Titanium Silver, and Oil Rubbed Bronze. The Titanium Silver is more of a brushed nickel silver and is great for almost anything. 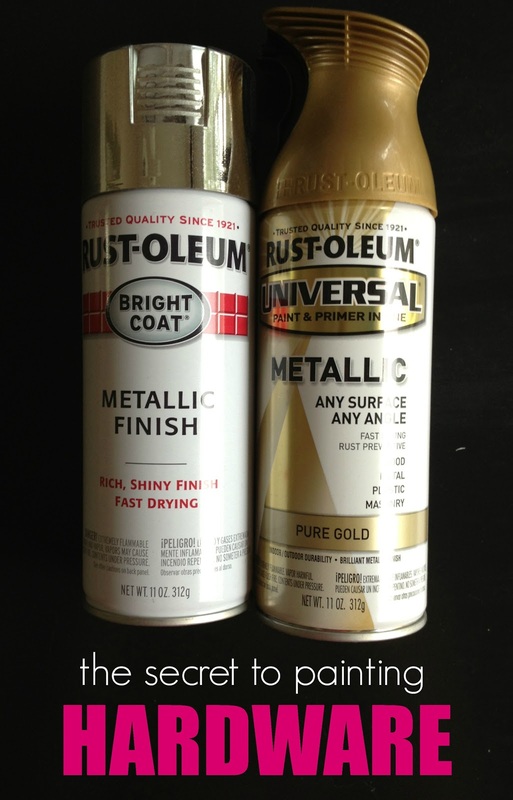 When I'm in need of a shinier chrome silver, my go-to is Rustoleum Bright Coat (far left). It has a gorgeous shiny finish. My favorite white is the Rustoleum Painter's Touch Gloss White. That stuff is amazing for little accessories...it seriously gives a flawless, ceramic-like finish. 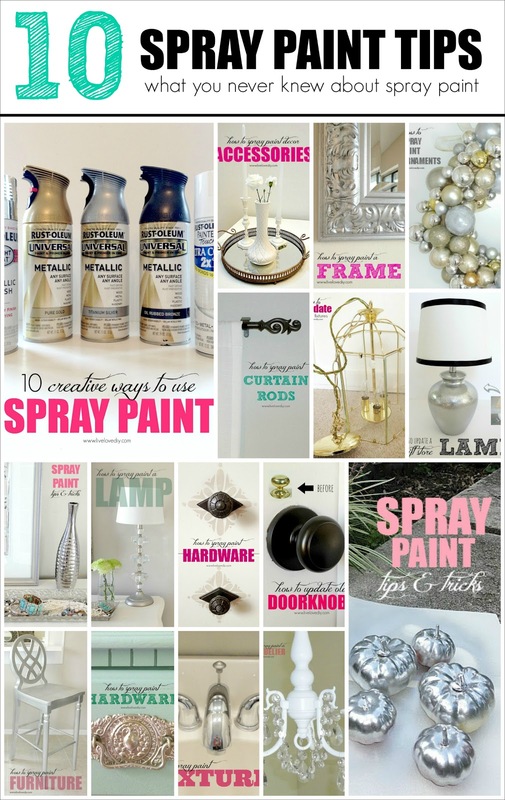 And those are my 10 spray paint tips! Check out PART TWO of this post here. Wow! This post is great timing. I'm planning to paint my 15 year old outdoor iron furniture this week. The white paint has oxidized and comes off on your clothes when you sit. Also flaked off in some spots. I was wondering about using a primer and will definitely do that now. I'll let you know how it turns out! 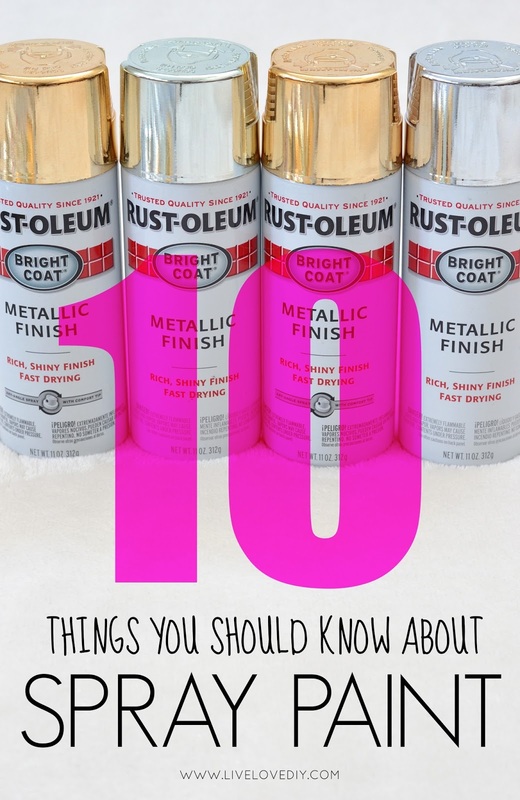 There's also spray paint that prevents rust! That might be a great option for your outdoor furniture! A woman after my own heart! I LOVE spray paint! Especially silver! I've done many projects indoors & out. Light fixtures, picture frames, furniture, planter pots, kitchen accessories, etc....! Appreciate the new information. Thanks! I just did my first DIY with spray paint, and I must say, I absolutely love it! Its super easy to use and can make anything look like new! Giving it a second go on my scratched doorknobs with your advice and tips. About halfway through after using the real orb spray paint and letting them cure longer, so far so good......Thanks for the inspiration! Yes, yes, yes! I don't like the textured tiny dots finish I sometimes get when I spray paint - do you know what I'm doing that causes that? I use the good Rustoleum stuff. Also as an FYI you can spray paint picture mats! I get frames with mats from the thrift store,take out the ugly art,and spray to get a black frame with a white mat. So much cheaper and more awesome. Also... "normal people store", hahahah! Yes, I do that all the time!! Love doing that! Also, not sure about the dots...I've never had that happen before! Maybe you have a clogged nozzle? I might try running some hot water through it. If the wind is blowing it will also cause a rough "dotted" texture. I think some of the paint dries before it hits the project. I just went thru your blog of spray paint, and I am inspired. I guess I'm so used to Modge Podge and glue guns that I forgot the third part in the trinity. And to that I offer up my apologies. Love your sight. Keep it coming. Love this post! I am also a big fan of paint, all kinds, but spray paint never ceases to amaze me. Rustoleum is my fave, too, but I buy other brands for the colors just like you. I haven't used the really shiny silver before, but will give it a try! this is undoubtedly one of the BEST diy posts I have ever read! you are a rock star ~ SO glad I happened upon your blog. This post is perfect timing for me. I just spray painted my first project. Bought cheap spray paint to see how it turned out; and its ok. You can check it out here and let me know what you think (if you like and/or have time)... http://blondiesbargains.blogspot.com/2013/07/restyled-thrifted-retro-artichoke.html I would appreciate your feedback and I am definitely heeding your advice in this post. Love it! Aw! So sweet! Thank you Lisa! Love it! Just yesterday, I stray painted the metal railing in my stairwell. :) I plan to do the door knobs sometime soon as well. Thanks for the great idea! Your comment about cheap paint is soooo true! I used Dollar store paint on a few projects and was very disapointed! Also when spraying foam insulation boards (also good for picture frames) the Rustoleum works better than the Valspar (test a sample before spraying the whole piece - learned that the hard way). I loved this post, Virginia. Hubby and I re-do furniture to sell and have spray painted some pieces before, too. I will definately pin this post for future reference. Once we re-painted an old white dining table for a bachelor friend with a silver top and black legs. He loved it. We also spray painted a junked dresser we picked up on the curb a high gloss black, replaced the knobs with silver ones, then glued one of those $5 long closet mirrors to the top to disguise the damage it had. Our total investment was less than $45 and we sold the dresser for $150. Not bad for a weekend hobby! 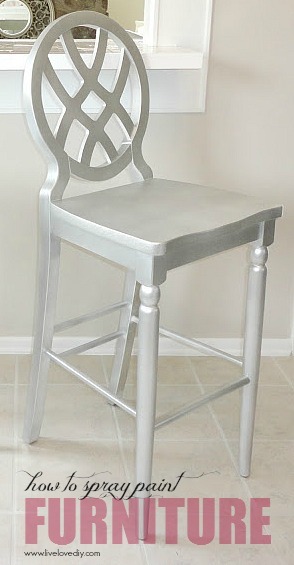 I saw the pic of the stool you painted silver and wondered it you remember where you purchased it from? I'm about to go spray paint crazy haha!! Thanks! Love your blog!!! 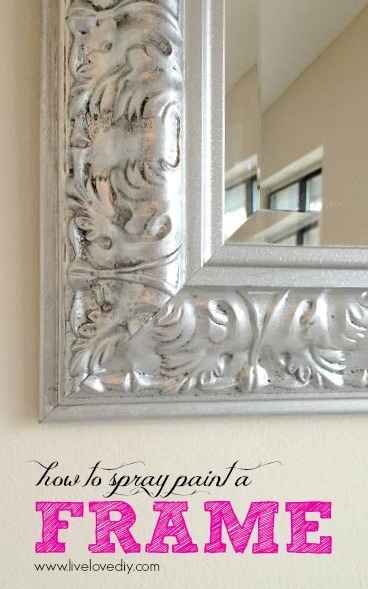 Just wondering if you could give some advice on the best white spray paint for picture frames, mirror frames, etc. (flat or satin or glossy?) and if primer is necessary? Spray painting, though it looks so easy to do, does have important factors to consider to achieve that perfect and even coat of paint. The distance of the nozzle to the object you're trying to paint, the size of the nozzle itself, even the length of time you should spend in one area. I am pleased to hear that after some errors while trying to do some spray painting projects, you finally got the hang of it. And what have you got here? Truly beautiful projects! Thank you for sharing what you learned with us and good luck to all of your future projects! Hi! I love love love your projects and tips! I see that you said to use a gray primer under dark colors and s white primer under lighter colors. I'm spray painting a chair frame gold and would like it to look as close to real gold leaf as possible. I even saw that krylon has a ruddy brown primer. Any idea which of those (white, gray, brown) would be best to use under metallic gold spray paint (specifically Montana gold "Goldchrome")? Any guidance you have is much appreciated! I have spray painted light fixtures, door handles, cabinet knobs, frames,etc. I also spray painted the ugly brass trim on my gas fireplace (house from the 90s). I used black matte heat resistant spray (used for grills). Looks beautiful and classy without the shiny brass. You turned on a light bulb in my head! Thank you for the information on which spray paints are best. I have a little entry way table I am going to sand and refinish matte silver. You have given me the courage to tackle this project! Thank you for a wonderful post! I have about 30 small glass taper candle holders and am wanting to spray paint them to have a "chrome" finish. I've tried Silver Krylon Metallic Spray paint but it's still giving me a silver finish rather than the mirror-like chrome finish. Any suggestions on how to achieve this look? Maybe a certain type of spray paint...Thanks! This post is amazing! So you never sand anything? 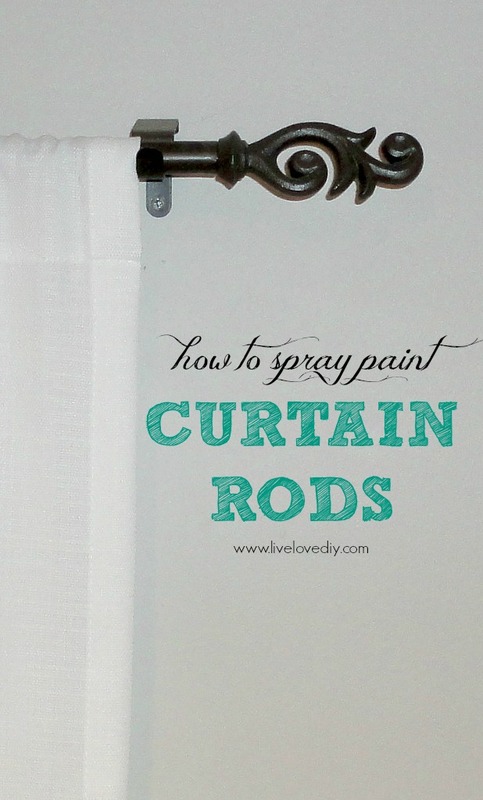 I have some white IKEA curtain rods that I'm about to spray paint Rustoleum GOLD but it seems sanding is recommended first. I'd rather skip this step! Your paint never flakes off? I'd love to hear your feedback! Thanks! Love your post! I have few dark brown wood frames that I was thinking of spray painting in metallic bronze color. Do you think I need to prime before I spray paint? If yes, can or spray primer? Any suggestions? Love to get your feedback. Thanks! I LOVE this post! 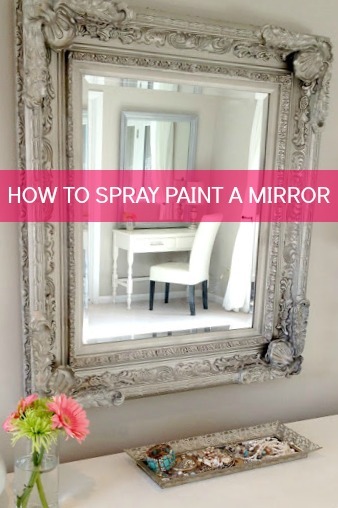 I found this while googling the best spray paint to use on a mirror. I think I've discovered a new awesome blog!! Anyway's do you know what kind to use on a mirror?! Here's my project... Dollar store wall cling letter, stick them on the mirror and then spray paint the mirror. Carefully remove stickers and Voila!! Cute picture mirror with a saying on it!!! Hope you can help! This post is so helpful! It has given me inspiration! One thing I have figured out is the difference between the glossy look and matte look :) Thanks for all the tips! Merry Christmas! Hi Virginia- Love your blog and congrats on your new baby! 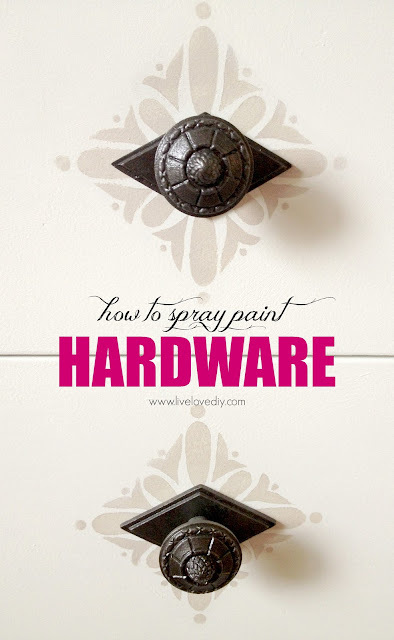 Quick question about spray painting your doorknobs - how are they holding up?